Of lamp shells and lophophores. 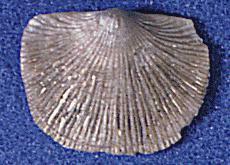 . .
Brachiopods are marine animals that, upon first glance, look like clams. They are actually quite different from clams in their anatomy, and they are not closely related to the molluscs. They are lophophorates, and so are related to the Bryozoa and Phoronida. Although they seem rare in today's seas, they are actually fairly common. However, they often make their homes in very cold water, either in polar regions or at great depths in the ocean, and thus are not often encountered. 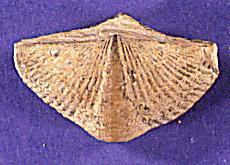 There are about 300 living species of brachiopods. Depsite their relative obscurity today, brachiopods have a long and rich paleontological history. During the Paleozoic era, they were extremely abundant. They diversified into a number of different morphologies and even participated in the build-up of ancient reefs. At the end of the Paleozoic, some 250 million years ago, they were decimated in the worst mass extinction of all time, the Permo-Triassic event. Their numbers have never been as great since that time. Click on the buttons below to learn more about Brachiopoda.